One of the many battles that takes place this week along the battle lines around Petersburg, Virginia is that of the Battle of Vaughan Road. Occurring on the western end of the miles-long battle front, Union forces gain ground on Confederate forces in this minor skirmish, securing control of an important road junction. It is a small victory, to be sure. Yet small victories have become significant in the protracted Siege of Petersburg: any ground given up by the Rebels is unlikely to be recovered by the outnumbered and out-gunned Southern enemy. Every inch gained is an inch closer to the Confederate capital of Richmond, the ultimate goal. And yet a restless nation will not forever forebear such incremental gains. Military victory has thus far proven excruciatingly difficult and elusive for the United States, agonizing many Christians of the North who remain convinced that the United States, the land of liberty for all, is God’s chosen instrument in freeing Southern slaves. Some equate the inability to achieve victory thus far as a price the nation is paying for many years of spiritual hardness of heart and social evils. ….God may be said to exercise a chastizing providence over his people, when for their good he allows them to pass through the furnace of affliction. “Whom the Lord loveth he chasteneth, and scourgeth every son whom he receiveth.” He also sendeth providential judgments upon wicked nations and men; as in the case of the ancient Canaanites. And in view of the intemperance, profanity, deceit, oppression, licentiousness and infidelity of our nation, it is no matter of surprise to the Christian philosopher that we should now be suffering the dreadful scourge of civil war…. Meanwhile, from the border state of Kentucky, a Union, anti-slavery Baptist writes of his own reservations about the pace and place of the war, in the face of another round of drafts. Benjamin Franklin Hungerford (1825-1916) records his thoughts in simple and brief script. The Draft occasions much uneasiness. Men have no heart for this war. God grant that it may soon cease! But his will be done. 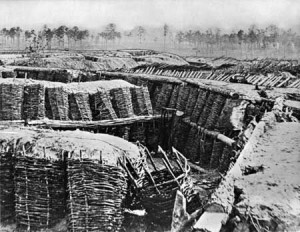 The war weariness at Petersburg and throughout the Northern home front is a great worry for politicians, none more so than President Abraham Lincoln, upon whose successful re-election in November rests the greatest likelihood of the United States persevering until the war is finally won.